Sales is a discipline. Like any other skill, it must be learned and refined. More over, it’s not about talking someone into something he doesn’t need or want; it’s actually about matching the needs and wants of the customer to the right product. We are all salespeople in one form or another. Even though you may think of yourself as a contractor, a well driller, or a pump setter, you’re also a salesperson. You’re selling the value of a private water system and all of its benefits. You’re selling the homeowner on the value your services provide and the value of the products you sell. If you’re involved in a state association, you may be selling your fellow contractors on the value of being a member of that trade association. You may even have to convince legislators of the value of private water systems and how protecting those resources contributes to the health of the greater community. Regardless of what you do, you’re always matching someone’s needs with the best solution–and trying to convince him of that. By the same token, if you’re not actively doing these things–if you’re simply waiting for the phone to bring you that next service call–you’re not selling your product. Day in and day out, if you’re not asking yourself, “What does my customer need and how can I give it to him? How can I make his life better? you’re not doing anything to improve your top line. You’re becoming dependent on your customers instead of making them dependent on you. Salespeople are resources of information and the vital link between the business and the customer. They make business happen. Sales requires knowledge of products, markets, competitors, and customer needs. It requires interpersonal, communication, and persuasion skills. Even so, it’s tough to find much of any instruction in this field. I’ve included above a listing of course categories for a nationally ranked, well-known graduate business school. Under the marketing category, there are 10 courses offered. 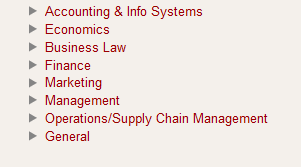 Under the management category, there are 16 courses offered, but none in sales management. Nowhere in their curriculum is a single course offered on sales, even though revenue is the top line driver of a business. Digging even deeper, it’s difficult to find an MBA program that teaches anything about the sales component of business, and it’s only slightly better at the undergraduate level. Via Google, I found a couple of schools that offer a Bachelor’s degree in Sales Management. But when I pulled up the 4-year curriculum for one of them, only 14 credit hours of the 120 required to obtain the degree were courses actually focused on sales. It’s up to us, then, to do what we need to do to get better at it. There are a lot of books, including some really good ones, that can help a person learn critical components of the sales process. Better yet, though, is to find a mentor. Look around for a success story; see who’s really got it together–regardless of the business or industry. Watch that person and learn. Establish a relationship and ask questions. Seek out best practices and use them in your business. Build your own support network. Learning how to be a good salesperson is too important for you to ignore–even if all the business schools do. This entry was posted in Uncategorized and tagged conversation, customer, groundwater, mentor, professional contractor, sales, training by markreeder. Bookmark the permalink.